The following information was compiled by my Great-Uncle Alfred Demmler (better known as Uncle Peter). Uncle Pete died in 1989 and the shield was given by his wife to one of her relatives. Unfortunately I don't know who this person is. Another family member, Great-Aunt Evelyn Demmler, married to great-Uncle William Demmler was also in possession of one of the shields. It disappeared after her death and we suspect that it was sold with her estate. 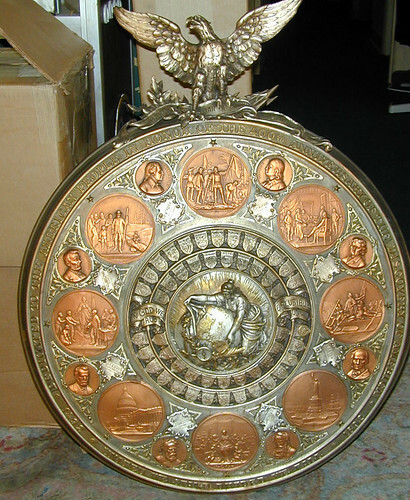 Two other shields exist in addition to the one given to President Cleveland. One belongs to the Klindworth family (I don't know them. The 4th one is in my possession. It belonged to my great uncle Oscar Demmler who passed it to my Dad. When my parents died in 2005, I gained possession of what the family refers to as the Demmler shield. "A small number of these shields were imported from Germany by Heeren Brothers Company, (a jewelry store then located at the corner of Penn Avenue and 8th street in downtown Pittsburgh. The motive behind the manufacture of these shields was revealed by the outermost peripheral inscription "dedicated to the American people in honor of the 400th anniversary of the discovery of America,,1892..' Following the actual discovery date...1492...the inscription continues "United we stand.. Divided we fall." "My maternal grandfather, Fred Mayer (born Sept 17, 1832 in Lauffen on the Neckar River, wurst berg, Germany) created most of the designs for the medallions, shields and plaques, as well as the large eagle at the top of the shield, above another inscription "westward Ho the star of empire makes its way". He transmitted these designs to a metal manufacturing company operated by two of his brothers in Stuttgart, Germany. They produced these shields made of pewter, bronze, copper (filigree), and sheet iron." "There are 8 large medallions showing various buildings and events in the first 2 or 3 centuries of American history. There is another ring of 8 small medallions depicting four presidents, Washington, Jefferson, Lincoln, Grant, and also four other notable figures, Clay, Morse, Longfellow, and Franklin." There is some additional information which I have not included because it is obvious by looking at the shield. I should add that in family lore there is no mention of a shield being given to President Cleveland. It just might be that Uncle Pete forgot or wasn't aware. The Demmlers were known to live well in their 90's and many suffered from dementia. Fred Meyers great grandson Frederick Demmler, was a very well-known painter who was killed during the last week of WWI. A book was written about him and he has a painting hanging in the Carnegie. My Great-great grandfather Fred Mayer remained a sculptor for the remainder of his life. At some point he immigrated to Pittsburgh and continued to work mostly in stone. There is a church in Pittsburgh that has multiple stone statues that he created. We also have a large stone lion sitting in front of my parents’ house. I hope that this information has proven to be helpful.